We, who are fortunate enough to live in the northeastern United States, are blessed with four distinctive seasons of change. Just as spring evokes our senses with the color of wildflowers and migrant birds, so does autumn with falling leaves and crisp nights. The fall is a time for quiet walks in the woods; crisp evenings under the stars by the campfire; fresh apple cider; hay rides and flocks of geese overhead. At Wellnesste Lodge, one of the autumn traditions for our family and for our many cabin rental guests is to make the annual pilgrimage to the Farmers’ Museum in Cooperstown, NY. There, every year, hundreds of volunteers put together what is known as the “Annual Harvest Fest”. Visitors enjoy old fashioned horse-drawn hay rides through the grounds of the living museum and see pristine buildings preserved over hundreds of years… the old school house; the blacksmith’s shop; the apothecary; the granary and dozens of other treasures are all open for exploration. Inside the buildings you’ll find volunteers/ craftsmen (and women) in period dress performing their specialties just like generations have before them. Out-of-doors you can wander the gravel paths and browse dozens of local merchants’ tents to find sweet New York maple syrup, apples, craft cheeses, ripened gourds & pumpkins, homemade jams, hand knit sweaters and so much more. The wonder of farm life is alive at this harvest fest and connects every visitor to the roots that made this country great in its infancy and still provides nourishment to all of us to this day. Milking the cows at the harvest fest in Central New York. Fall harvest fest enjoyed by Wellnesste Lodge Guests. Another favorite sight here is the ability to see children of all ages enjoying the many farm animals roaming about. You’ll witness animals that have been raised since birth as prized members of Central New York farm families and are brought here to “show off’ and share with the attending public. Farm fauna including cows, bulls, pigs, goats, oxen and sheep are a pleasure to enjoy and snap a candid photo with. The small children love to walk about the courtyards amongst free range chickens. They’re also thrilled by the gobbling turkeys and enthusiastic quacking of the farm’s ducks. Perhaps the most treasured of the children’s animal interactions is the ability for everyone to try their luck at milking a cow by hand (a task that’s certain to connect both young and old to our ancestor’s farming roots). The fresh air and milling about is sure to make your belly rumble and your thirst long for something wet to down. Fear not for no one should go hungry or thirsty at this harvest fest as there is fare for all to enjoy. Pick up a cup of hot beef barley soup cooked in a cast iron pot over an open fire. Or perhaps enjoy an ear of delicious roasted corn dipped in butter- a cardiologist’s delight! An old fashioned SaranacGinger beer or Root beer is the perfect libation to wash those goodies down and a slice of homemade apple pie with fresh whipped cream is a must to top off your bellies’ delight. 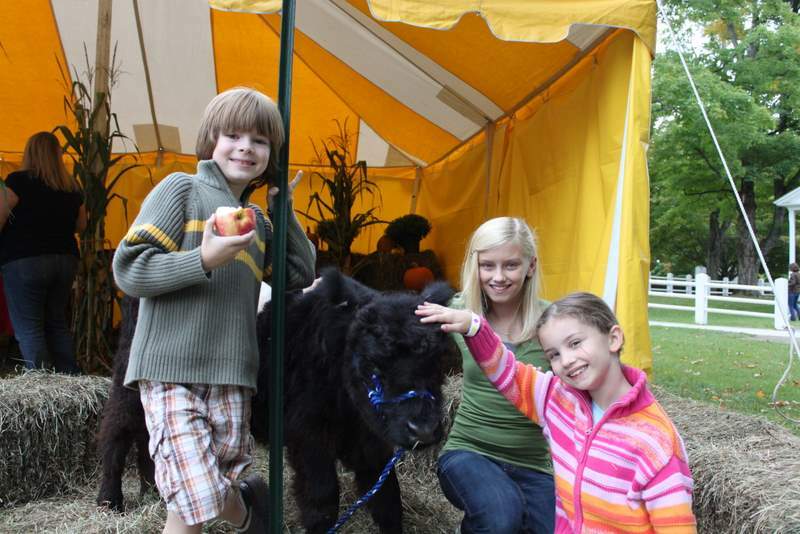 There are countless other fun things to do here at the annual harvest fest and there’s literally something for everyone to enjoy. Perhaps the reason we love this time of year and this tradition so much is because it gives us the opportunity to enjoy the cool air, fresh smells, gorgeous autumn foliage and time together as a family. That, after all is what I believe the founding fathers likely had in mind- life, liberty and the pursuit of happiness (on a fall afternoon in beautiful Upstate NY).